Grandchild number 4 was born last Feb and for her first birthday I completed her quilt. The top and back are flannel and the sheep bodies are a textured Minky (all from my stash). All the applique is is done by machine; the bodies, faces and ears were lined with a light cotton, the wheel circles edge-turned. I free-motion machine quilted the quilt. The odd ear or tail was left loose for some texture and interest. The ‘open’ eyes where hand appliqued in place. Apart from the fact that doing those two eyes was so tedious, I stem-stitched stitched the ‘asleep’ eyes with embroidery floss. 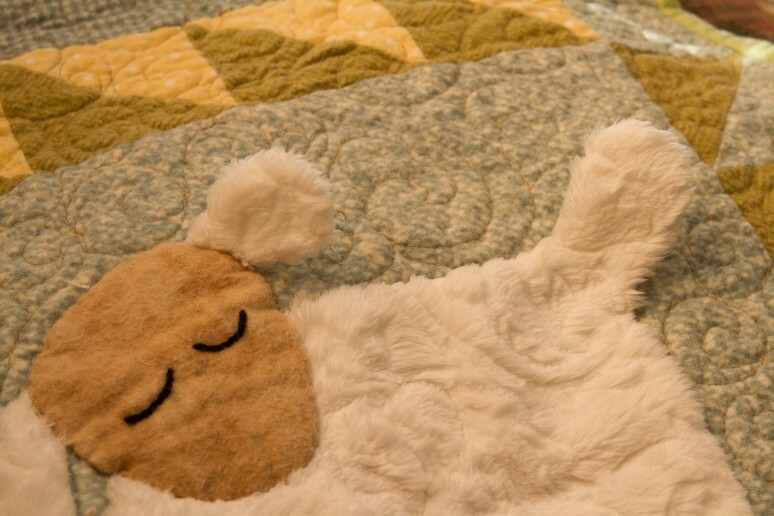 One of our favourite kiddie stories is “Russell the Sheep” by Rob Scotton, a delightfully illustrated story in which a sheep has difficulty sleeping. 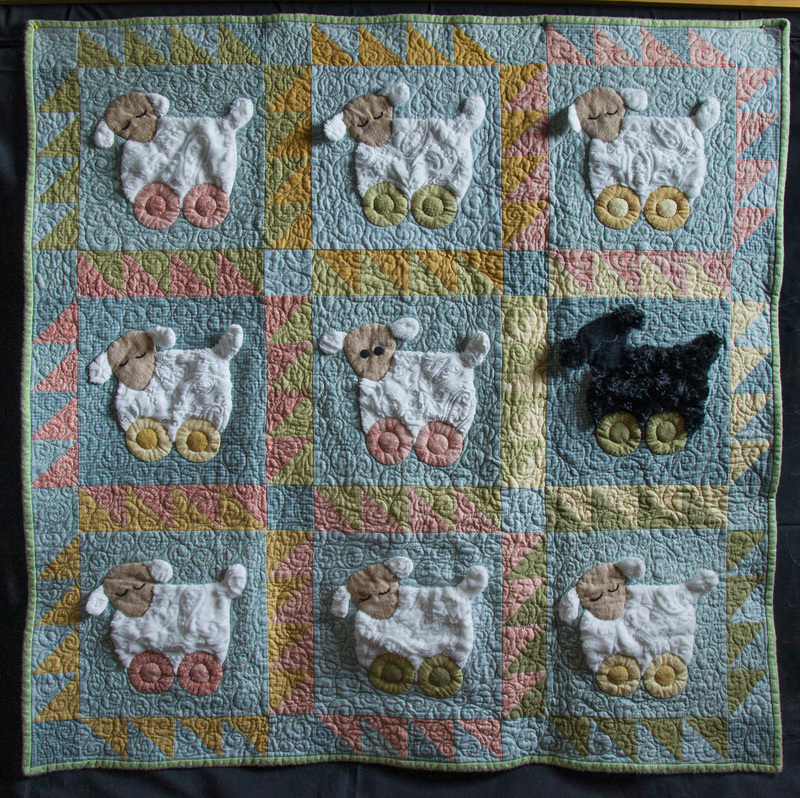 “What’s a sheep to do?” It was fun to adapt this quilt to go along with the story. I forgot to snap a shot of the quilt back which was also pieced from scraps so will add after my next Miss Macy visit. The sheep are adorable, especially the 3-D tails and ears. I love the idea of using minky for them. 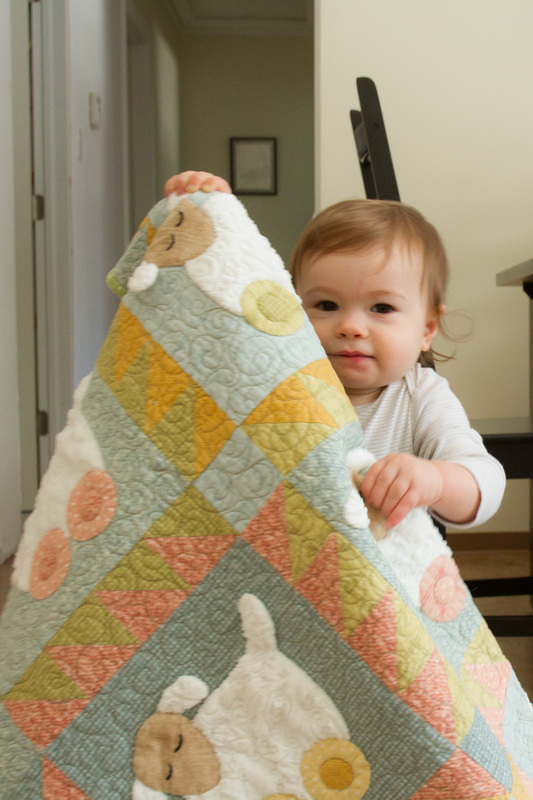 All the same, the quilt holder wins top mention for cuteness! Thanks so much for looking and for your kind comments. It’s so much fun to make each project unique.